Fred Flintstone's Fiesta suspended high above Cologne? The car sculpture "Steinerne Zeit" ("Stone Age") from artist HA Schult is leaving the Museum für Aktionskunst in Cologne and moving to its new home. WASEL has a new "work horse"
Fully-integrated construction site logistics on the most rugged terrain requires an adequate fleet of equipment. WASEL GmbH was distinguished as the best partner firm in 2018 by a company in the petrochemical industry from the greater Cologne area. WASEL’s range of services include safety measures for construction sites and barriers and safe traffic routing measures for roads, major events and trade fairs. The company’s Traffic Services Department recently welcomed a brand-new transport vehicle straight from the production line. Every year, “BIG WILLI” transports more than 30 luxury yachts from the river Rhine to the Düsseldorf exhibition grounds for the company Messe Düsseldorf. This important piece of equipment recently underwent a technical refurbishment. A coal conveyor bridge weighing approx. 100 tons at the abandoned Voerde Power Station was recently successfully dismantled. WASEL GmbH has once again been awarded the CrefoZert credit rating certificate by the credit risk management company Creditreform in the German city of Cologne. By awarding this certificate, Creditreform Köln has attested that the company still has an extraordinarily good credit rating in 2018/2019. This summer, after two years of preparation, a 480-metre-long former coal conveyor bridge in the German city of Gelsenkirchen was dismantled. WASEL was once again awarded the title of STRATEGIC SUPPLIER by the "purchasing performance" procurement department of the RWE Group, a major electricity and gas company. With an impressive height of 134 metres, this tower crane installed at the beginning of May is not only probably the tallest crane site in Berlin/Brandenburg but also offers a breathtaking view of the capital city below. The installation of this construction crane was certainly anything but ordinary. WASEL recently met special demands made by a customer for transport requirements in the field of open-pit mining by purchasing two TATRA Phoenix 8x8 chassis. WASEL recently put two brand-new cranes from the LIEBHERR LRT model line into service. WASEL’s new 750-ton crawler crane has been in use since summer 2017. In the north-west of the German federal state of North Rhine-Westphalia, a wind farm is currently being constructed, which involves pulling turbine houses weighing 100 tons up to a height of 159 metres. On 20th November 2017, Matthias Wasel was able to collect the first two of a total order of six rough-terrain cranes from the new LRT series from the Liebherr factory in the German town of Ehingen. We have now received two of a total of three new 4-axle Mercedes Benz semi-trailers, type 41.580 8x4, states the WASEL management, expressing their delight with the new members of the fleet. The Reconstruction of the Cologne City Archive – WASEL Is Part of It! The reconstruction of the Historical Archive in the German city of Cologne, which collapsed in 2009, is now well underway. The project is due to be completed by 2019. WASEL has achieved 28th place in the list of the world's largest companies in the specialised transport and crane industry. Traces of a 15-year-old girl have been found in a car in a scrapyard in Cologne. Chief inspectors Max Ballauf and Freddy Schenk suspect that they might have something to do with the case of the murder of Sarah Stellwag, in which two girls went missing in Leipzig and turned up again in Cologne. A new building for the Faculty of Biomedical Sciences is currently being constructed on the campus of RWTH Aachen University. One of the tasks involved in the construction work was lifting concrete trusses weighing up to 25 tons up into the building's 28-metre-high shell. Nine large pipes for an industrial condenser system, each weighing 32 tons and with a length of up to 40 metres, were recently transported through the Rhineland region of Germany on an overnight journey. WASEL is responding to the development of the wind energy industry as it progresses towards larger and larger plants by investing in a next-generation crawler crane. An old steel frame bridge that once belonged to the Graf Bismark coal mine and coking plant in the German city of Gelsenkirchen was recently disassembled. A block of six-storey buildings is currently being constructed on a site covering around 15,000 square metres and located between the police headquarters and the Odyseeum museum in the Kalk district of Cologne. The 2/2017 issue of the Mercedes-Benz "Transport" magazine features a report on the transportation of several heat exchangers, each weighing up to 138 tons, from Neubeckum to Hiltrup. Readers of the German trade magazine SCHWERTRANSPORT (HEAVY TRANSPORT) have selected a WASEL project as "Heavy Transport of the Year 2017", thus enabling WASEL to be awarded the title for the second time running. Who will be WASEL's "Next Top Model"? Over a three-day period in April, WASEL employees recently enjoyed a new and unique experience in the form of a special photo shoot. Comprehensive construction work on the extension and renovation of the infrastructure of the WASEL headquarters has now been completed after a total of one and a half years. Doing nothing is just like going backwards! This is precisely why WASEL has decided to also continue to invest in its own fleet of cranes in 2017. This decision enables WASEL customers to benefit from the latest standards with regard to safety, reliability and efficiency in lifting technology. Given the extremely small amount of space available at the heart of Düsseldorf's old city centre, a recent project involving the installation of a water tank weighing 1.3 tons on the roof of the private brewery "Zum Schlüssel" demanded the use of innovative lifting technology. Have you always wanted to experience the perspective of a tower crane operator? Well, now you can! Kall, a town nestled in Germany's Eifel region, was the scene of unusual "air acrobatics" involving a MIG 23 fighter jet. RWE's Excavator 259 in the Hambach open-pit mine was recently the scene of a spectacular assembly project. After 57 years of operation, it was time to replace the 100-ton bucket wheel. WASEL has achieved 29th place in the list of the world's largest companies in the specialised transport and crane industry. A 400-ton telescopic crane disassembles a tower crane on Michaelsberg hill. The local newspaper, Rhein-Sieg-Anzeiger, covers the story. Readers of the German trade magazine SCHWERTRANSPORT (HEAVY TRANSPORT) voted a WASEL project the "Heavy Transport of the Year 2016"! Trade fair innovation boosts the flexibility, efficiency and profitability of WASEL heavy goods transports. The Chemistry Has to Be Right! The installation of a cooling element weighing 155 tons involves impressive teamwork between man (or better said, men) and machine(s). When recently transporting a 29-metre-long heat storage tank weighing a total of 99 tons from the German town of Steinhagen to the Swiss city of Zurich, our transport team was confronted with a particularly special challenge. Making no compromise on safety and technology is the maxim followed by WASEL. This was one of the main reasons behind the company's recent acquisition of a total of 37 new machines from the Liebherr brand, which is certainly an impressive number for the first half of 2016 alone! A 500-ton telescopic mobile crane was recently used between the Cologne-Mülheim and Leverkusen interchanges on the German A3 motorway. WASEL has donated over 27,000 Euros to the "Dat kölsche Hätz" charity association for children suffering from cancer. In mid-November, we received a letter from the management team of the company BP Gelsenkirchen GmbH expressly thanking all those involved in the project work on one of the largest turnarounds to be carried out for several years at its refinery plant in Scholven, Germany. ... with the help of a so-called ro-ro (roll-on roll-off) pontoon, we can also transport our heavy loads on waterways. Sometimes even a crane has to take a flight – in a figurative sense, of course. As a Liebherr dealer for tower cranes in the Berlin/Brandenburg region of Germany, the WASEL branch in Berlin has acquired an attractive construction project in Dresden, the capital city of the State of Saxony. Excavator 291 used by RWE, a major European electricity and gas company, at the Tagebau Hambach open-pit mine recently formed the setting for a spectacular assembly project. After 32 years of operation, the excavator's 130-ton bucket wheel needed replacing. 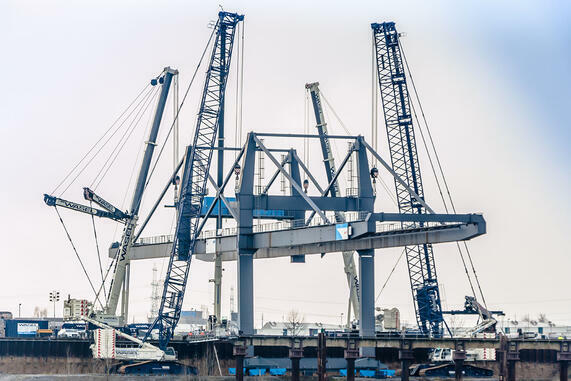 In the German town of Rheinberg, situated on the banks of the Rhine, the slewing ring of a ship-to-shore crane had to be disassembled and replaced. This summer, the specialists from the heavy-duty logistics company and crane operator WASEL used two Liebherr LTM 1500-8.1 mobile cranes to complete an impressive job by the river Rhine close to the German town of Dinslaken. The job involved shortening two 138-metre-high electricity pylons and reconstructing the tops of the pylons as part of renovation work. Transporting a winding engine used in mining from the town of Haiger in the Lahn-Dill district of Germany across the German Land of Hesse to the town of Neuhof near Fulda was a real challenge. The editorial team of the German newspaper Bild is currently reporting on a major operation carried out by WASEL on its Bild Online website (www.bild.de). The new MK88 makes working under overhead lines or higher tower cranes or in close proximity to airports an easy task, with no reduction in load capacity at maximum tower height. WASEL has achieved 27th place in the list of the world's largest companies in the specialised transport and crane industry. We have now received the compatible heavy-duty tractor units for our Goldhofer axle lines. A total of 630 PS on each of three driven axles enables the units to transport even the heaviest of loads. You can find the report (in German) released by the company Goldhofer on the delivery of our 38 new axle lines here. Four of our large cranes were needed to bring a 560-ton crane bridge (without a trolley) that was 190m long, 21m wide and a total of 35.5m high into position. We are pleased to have received our second 750t Liebherr LTM 1750-9.1 Mobile Crane, which made its way directly from the Liebherr factory to its first assignment. This year, we have successfully upgraded our SCC certificate to an SCCP certificate!